In a recent Forbes article, Brian NeSmith examines the cybersecurity job market. As hackers ramp up attacks with increasingly sophisticated methods and tools that are readily available for purchase on the dark web, the “white hats” need all the help they can get. According to recent estimates, there will be as many as 3.5 million unfilled positions in the industry by 2021. Our Fall term is starting soon and space is still available in a few courses. Interested in taking a course for professional development? Contact BCIT_Forensics@bcit.ca for more information on approval to register. This course focuses on the application of crime analysis tools, techniques and methods to support crime reduction initiatives, criminal investigations, and effective deployment of police resources. Students will learn how to prepare crime statistics and crime maps, identify crime patterns, develop concise and effective written products, and attain a thorough understanding of the current state of the Crime Analysis field in Canada. Class Meeting Times: Saturdays, September 8 – October 13 from 08:00 – 17:00 at the BCIT Downtown Vancouver Campus. This course provides a broad overview of forensic document examination. It is intended for anyone who may have a need to interact with forensic document examiners, e.g. investigators, lawyers, corporate compliance officers, police and crime scene officers. The course will include the requirements needed to enable forensic document examiners to conduct examinations of signatures, handwriting, office printers, printing and other physical evidence relating to documents. NOTE: This course will not train students to become forensic document examiners. Class Meeting Times: ONLINE September 16 – December 2 with two in-class sessions on Saturday December 1 and Sunday December 2 from 09:00 – 16:00 at the BCIT Burnaby Campus. Interested in learning more about Forensics at BCIT? Join as at our next Info Session on September 17 starting at 6pm at the BCIT Downtown Vancouver Campus. Register here to attend. 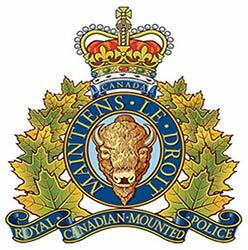 The RCMP E-Div Special I Unit section is hiring. There will be an Information Session about the hiring process at the BCIT Downtown Vancouver Campus. Please arrive on time and prepared to ask questions. BC Hydro is looking for two full-time Cybersecurity and Risk Compliance Analysts. See the full job posting and how to apply here. BC’s top tech companies are looking for developers, QAs, data analysts, UX/UI designers, IT and DevOps engineers, and project managers! If you are a tech professional in one of these roles who is looking for your next dream job or looking to connect with awesome local tech employers, join us at the next Talent Day! Hosted by BCjobs.ca in partnership with the BC Tech Association, Talent Day is an opportunity for you to network and connect with top notch tech companies in a casual setting. Don’t miss out on this chance to meet recruiters and technical reps from Vancouver’s best companies face-to-face, learn about new opportunities, and build a strong connection to continue the conversation later! The Canadian Security Intelligence Service (CSIS) is looking for IT Graduates to join their organization. Candidates applying must be a graduate or within one (1) year of obtaining a university bachelor’s degree or technologist designation in the field of Information Technology. You must be eligible for an Enhanced Top Secret security clearance. The process involves a security interview and a polygraph. There is also a background investigation that includes credit and financial checks. Using illegal drugs is a crime. Drug use is an important factor in your reliability and suitability assessment. This is part of the selection process. So do not use drugs starting from when you submit your application. See the full posting and how to apply here. 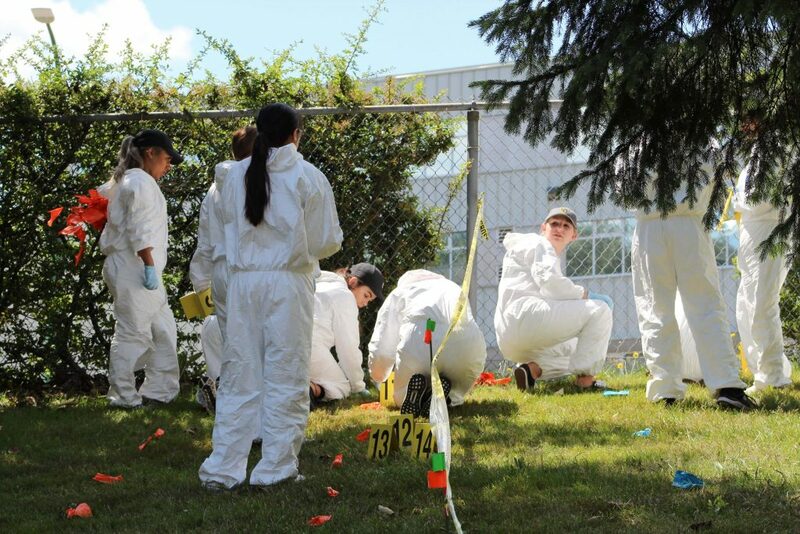 A team of 23 Criminal Justice undergrads from California State University spent the afternoon at BCIT Burnaby Campus combing through an extensive crime scene, collecting evidence, and searching for the missing pieces to solve the crime. The scene consisted of a crashed vehicle, dead body, and skeletal remains which may have looked real, but the faux crime-scene was all a part of the kick-off to the third annual, two-week field school, hosted by the Forensic Science and Technology department. The scene takes on elements that they might find on the job, and for these students this is the first time they are in the field suited up and playing the part. “The field school follows the applied-learning model at BCIT, the students receive the hands on learning while exploring all areas of the field including cyber crime, crime scene analysis, and forensic biology/chemistry,” comments Dean. 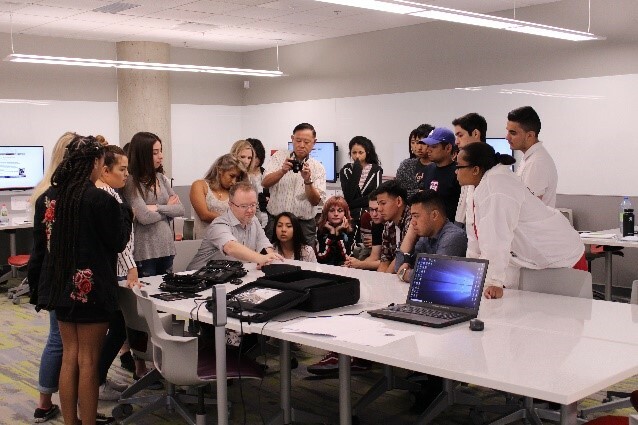 “We have to learn something beyond our borders, we have to have a global perspective and prepare our students to have a comparative understanding of different processing techniques at the crime scene and forensic analysis methods in the lab,” says Professor John Wang, California States Long Beach, who has taken his students to BCIT for the third year now to take part in the field school. Learn more about the various areas to study within Forensic Science at BCIT. MNP is seeking an Analyst for their growing Forensics team. Protecting businesses’ best interests, MNP is a leading national accounting, tax and business consulting firm in Canada. Their recognized Forensics team combines accounting and investigative expertise to resolve fraud emergencies. Their professionals conduct assessments that gauge an organization’s vulnerability to fraud and help implement anti-fraud controls to reduce exposure to criminal and civil wrongdoing. Learn more about our Forensics Programs by visiting our website. We collaborated with BCIT’s Communication Department to create a new course designed specifically for students in the Forensics Bachelor of Technology programs. This course provides practice in written and oral communication skills used in forensic science and investigation careers. The emphasis is on explaining technical material in plain language and communicating investigation results in reports and presentations. The course also includes techniques for e-mails, letters, reports, and for making oral presentations. Students prepare a professional job application and LinkedIn profile and examine strategies for maintaining their online reputation as professionals. Set communication objectives and identify the needs of the audience in a given situation. Design documents for reader access. Write clear, correct, and concise sentences and paragraphs in plain language. Design and use appropriate visual aids in oral presentation and reports. Organize and write effective investigation reports for the workplace. Write effective workplace messages in e-mail, letters, and memos. Prepare a persuasive letter of application, a professional CV, and LinkedIn profile. Edit your work to meet professional standards in the use of English in technical writing. Registration is available for the Fall term offering! We are hosting our annual Bachelor of Technology Graduates Research Day on June 22, 2018. Students from our Crime & Intelligence Analysis, Digital Forensics & Cybersecurity, and Forensic Science programs will be presenting their projects throughout the day. Interested in attending? Please email BCIT_Forensics@bcit.ca for more information.